NEW YORK — Butler coach Chris Holtmann first saw the leadership, the drive, the tenacity of senior forward Roosevelt Jones two years ago when the Bulldogs were on an overseas trip to Australia. While most of the players were getting into the Down Under groove, Jones was going high motor overdrive in practice. 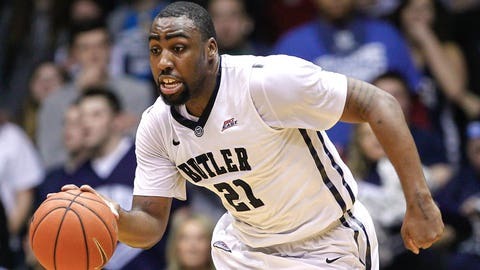 Defense has been Butler’s calling card since its back-to-back Final Four appearances in 2010 and 2011. Holtmann would like it to be the Bulldogs’ persona again this season, but that won’t be easy. Kameron Woods and Alex Barlow, two defensive beasts, are gone. Butler, which was picked second in the Big East coaches’ preseason poll, should be better on offense with the return of first-team guard Kellen Dunham and NC State transfer Tyler Lewis. But Jones will have to constantly remind teammates with his attitude and play that defense is Job One. He sounds up to the task. Of course, keeping Butler’s defensive mindset seems like a day snorkeling the Great Barrier Reef compared to what Holtmann experienced last season. Two days before practice began, Holtmann was told head coach Brandon Miller was stepping aside because of a still-undisclosed medical issue. The Bulldogs were coming off a 4-14 league record. Holtmann had to pick up the pieces. Under Holtmann’s steady hand, Butler went 12-6 in the league and 23-11 overall, good for a No. 6 seed in the NCAA tournament. They lost a close one to Notre Dame in the Round of 32. Good thing they have Jones, who’s more than willing to bleed. Villanova: Can they rule March? DePaul: Ready to step up? Georgetown: Set for return to glory? Seton Hall: A year older and better? Xavier: Last team standing again?